« 2016 Cannonball Race Of The Century. Stage 4 Results. Baritone Slip-Ons. A New Tune For Your Exhaust. Published by Cyril Huze September 14th, 2016	in Customs, Editorial and Exhaust. Firebrand’s new Baritone Slip-Ons were inspired by the shape of a classic microphone. 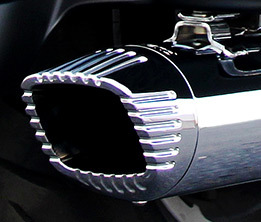 Available in show quality chrome or black ceramic mufflers and with your choice of chrome, black or contrast cut billet end caps. The Baritone 4” Slip-on’s fit all Harley Touring models including Tri-Glides and those with extended and skirted bags (Freewheeler specific version also available). Additionally the end caps can be rotated to 4 different positions, allowing for even more customization. Equipped with 2.5 inch perforated core baffles wrapped in dual density packing, Engineered to produce a deep bass tone and increased performance in both stock and modified engines. Made in the USA by Firebrand. Chrome versions start at $799.95, Black start at $849.95. Damn! I dig how the square tip matches the shape of the bags. Did you forget Indian motorcycle? The Baritone’s have been developed for Indian and ’17 Harley Touring models and will be available soon.